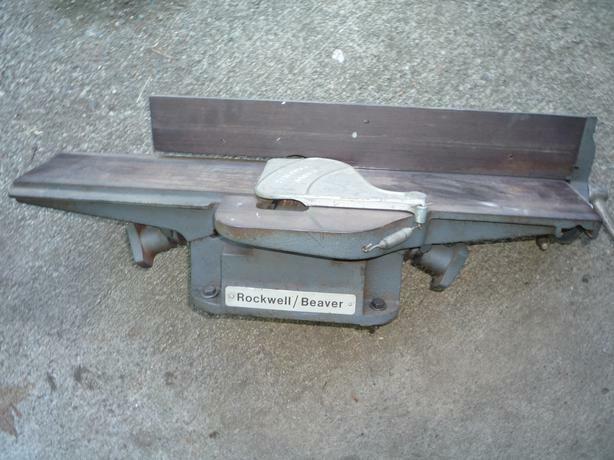 I just got a old Beaver 4" jointer that looks very similar to this one. I used it for the first time this weekend and it was awesome. I am wondering though if I was doing something inherently wrong while operating. I was processing some pallet boards which were 4' to 8' long and since some were so long I found myself walking along the jointer with the board to keep it flush against the base and fence. I thought that maybe I was supposed to feed from behind but that didn't make sense as I would not be able to maintain downward pressure as the board passed over the cutter. How should my body be positioned while operating a jointer? Most woodworkers I know, including myself, walk along with the board when jointing, to some extent; but for long boards they stay in one place either at the infeed or outfeed side and use the push pads hand-over-hand to "walk" the board across. You should put downward pressure on the infeed table when starting the cut and on the outfeed table when ending the cut, but there are two schools of thought for what happens in the middle. Some keep pressure on the infeed table and others keep pressure on the outfeed table. Personally, I think it makes more sense to put down pressure on the outfeed table, but I have woodworker friends who do the opposite and produce much nicer work than anything I've ever made. As long as you stick to one or the other, you should get a good result (except perhaps at the very ends), even if your infeed and outfeed tables are ever-so-slightly out of parallel. In terms of safety, you should try to keep your hands at least 6" away from the cutterhead at all times, which also means you shouldn't joint anything shorter than about 18-24". As Doresoom mentioned, you should use push pads. Because you're usually working with longer pieces, push sticks and push shoes might not work as well on a jointer as they might on a table saw, though I suspect Matthias Wandel might still use push sticks on a jointer. Ideally you should never pass your hands over the cutterhead, even if you are using push pads, but this can be very awkward at first, and at least one of the more famous instructional Internet woodworkers walks along with his workpiece and passes his hands right over the cutterhead (with push pads, of course). You can use featherboards for face jointing, but most jointer fences are not tall enough to use featherboards for downward pressure when edge jointing wide boards. I don't own a jointer myself, but I watched my dad use his for years, and he always used a pair of flat push blocks with handles and rubber pads on the bottom for friction. Using this type of push block will allow you to safely maintain downward pressure on the work piece while it's over the cutter head. You may also want to use a variation of this with a cleat for your trailing hand to allow a better grip for forward feed pressure. If you decide not use push blocks, at least make sure to keep your hands away from the leading edge of the board when it's only a few inches onto the outfeed table. A sudden kickback with your hand in that position could lead to it getting drawn into the cutter head. As for safe operating position, stand to the side of the jointer, and stay out of the kickback danger zone behind the machine directly in line with the cutter head. This old Shopsmith pamphlet (PDF) has a bunch of good tips on safe jointer use, although some are specific to the particular model. Position yourself centered in front of the cutterhead and use both hands to keep pressure over the cutterhead; as one hand passes, replace the other hand to continue pushing. Do not leave hands near either end of the stock being jointed. 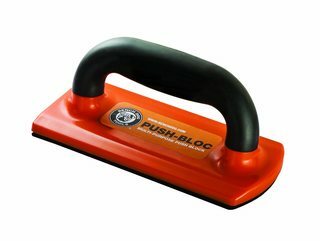 Personally, I've never used a push stick or push block but perhaps I should start considering the document Doresoom linked. I've never had kickback or other accidents on my jointer but one time would be enough to turn my hands into hamburger. On a related note, make sure your outfeed table is adjusted so that the cutter just kisses a board parallel to the table. Ensure your outfeed table is properly adjusted: Lower the outfeed slightly. Feed a piece of scrap through until you have a lip projecting over your outfeed. Shut off your machine, then raise the outfeed until it just touches the bottom of your cut portion and lock the table. Joint the face first, then use that flat face against the fence to joint an edge. For edge joining, each board has a good face. Joint one board with the good face away from the fence and the other board with the good face against the fence, this will ensure that even if your fence isn't perfectly square, the boards will join perfectly (supplementary angles. Go go gadget geometry!). If your board has a cup, joint the concave side down, then use a planer to remove the convex portion. A jointer is a fantastic tool to have in the shop, congratulations on your new dangerous toy! Not the answer you're looking for? Browse other questions tagged safety power-tools pallet jointer or ask your own question.